Marianna Savva is a Social Worker, working as a Family Counselor at “Hope For Children” CRC Policy Center in the context of Children’s House in Larnaca. She is responsible of providing services to sexual abuse cases, like social support and rehabilitation services to children and their families. Marianna has studied Social Work at Democritus University of Thrace. Furthermore, she received two master’s degree in Social and Developmental Psychology from the University of Cyprus and a master’s degree in Social Work in Education from Democritus University of Thrace. She has previously worked as a Social Worker at the “Pilot Programme regarding Foster Care for Unaccompanied Minors asylum seekers / beneficiaries of international protection”. She was responsible for the socio – economic evaluation and the training of the potential foster parents as well as for the follow up after the placement. She was also responsible for monitoring all the foster cases. Prior to that she has worked as a Social Worker and Officer, at the Shelter for Unaccompanied minors “Home for Hope” providing support and guidance to the shelter’s residents, while she was delivering workshops to children at schools and lectures to teachers and parents. 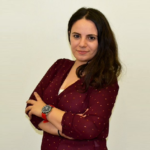 Marianna has worked in Diagnosis, Differential Diagnosis and Support Center of Rodopi (Komotini) in Greece, as a School Social Worker, providing support to students, teachers and parents at primary schools in Komotini. She was implemented prevention groups targeted to public school students for the prevention of bullying, racism and diversity.